I experienced a palpable mix of elation and dread when I got the notification that the next issue of Saga was on its way to me. The long-running war story ended its last arc on a hopeful note with a cast reunion, an emphasis on the gentler natures of the younger generation, and a burgeoning romance simmering on the back burner. So, obviously, none of that’s going to last long. I’ve always been impressed with how this book never shies away from being specifically relevant to the current American landscape. 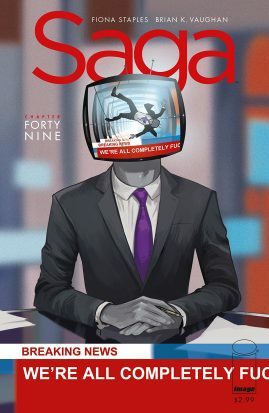 The cover of issue #49 depicts Prince Robot IV as a newscaster imagining his own death while partially cut-off “Breaking News: We’re All Completely Fuc-” titles scroll below. More and more that’s what watching the news feels like, and it’s not hard to imagine it’s probably what it feels like for the people working behind the desks. In the issue’s most affecting moment, Hazel and The Squire are squabbling like siblings when Hazel lets a moment of rage take her words much too far. She immediately regrets it, but the damage is done and the emotional wound she inflicts on The Squire sends him running from the room. “You told us to use words,” she complains to her defacto nanny Ghüs, proving that words can often be just as sharp as weapons – or baby teeth, in this case – and perhaps cut even deeper. Vaughn drives the point home by taking a moment via the narration to explain insulting someone face-to-face is a kind of gift in a world where no one’s afraid to do it from behind a screen. Hear, hear. The rest of the issue sets up the new arc, with Prince Robot IV, Marko and Alana all trying to do the best by their families even as journalists Upsher and Doff scheme to figure out the best way to do the same for each other. It already looks like there won’t be a way for everyone to succeed on these fronts, and the issue reminds us that Ianthe and a hostage-bound The Will are drawing ever nearer to tracking down our merry band of outlaws, which bodes ill, to say the least. Oh, Saga, I miss you when you’re gone but get way too emotional when you’re here. Nonetheless, I can’t stop and won’t stop. See you next month. The Terrifics is a gosh darn DC Comic with a capital Dee Cee and I love it! Spinning out of Dark Nights Metal, The Terrifics # 1 begins with Mister Terrific (AKA Michael Holt) checking in on the slimy Simon Stagg. See, Stagg bought Holt’s company while Mr. Terrific was off fighting threats from the Dark Multiverse. And the first thing Stagg does? Manipulate his the love of his daughter’s life, Metamorpho, into helping him explore the seedy underbelly of the Multiverse with his recently dubiously (if legally) acquired Terrifitech. Mr. Terrific and a catatonic Plastic Man show up just in time to get sucked into the Dark Multiverse with Metamorpho. The Terrifics # 1 is a lot of set up. It introduces Mr. Terrific, Plastic Man, Metamoroho and the Legion of Super Heroes’ Phantom Girl to each other and sets up what will eventually be their superhero sci-fi adventures. The main locale of the issue is the corpse of a giant Kirby-inspired god that’s floating through the Dark Multiverse. It looks like a cross between Galactus and Kirby’s Lord of Light and it’s populated by a bunch of space crab/spider-looking creatures. Mr. Terrific and company follow a distress call to the heart of the creature. At first, they think it’s Phantom Girl’s, but when she says she’s been there for a long time and didn’t have any kind if distress beacon, they explore further. Following Promethea’s appearance in Justice League of America, The Terrifics introduces another ABC character into the DC Universe – Alan Moore and Chris Sprouse’s Tom Strong. 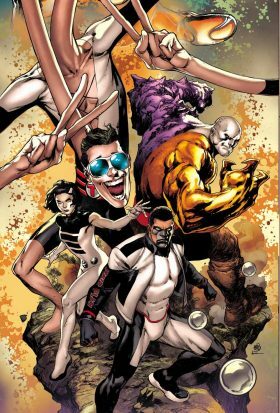 As to what role Tom Strong will play in the series, we’ll just have to wait for The Terrifics # 2. It’s a heckuva cliffhanger. Lemire and Reis have put together a super fun comic. This issue is firmly rooted in the DCU. Mister Terrific, Metamorpho, Simon Stagg, Sapphire Stagg, Plastic Man and Phantom Girl are some of my favorite characters and seeing them on a team that’s gotta go look for Tom Strong in the Dark Multiverse is kind of everything I like about superhero comics. I can’t wait for the next issue.